Merrick vs Blue Buffalo 2019 : The deliciously Pet-rifying Showdown! Nutrition is integral to physical and mental well being so it should be given utmost attention. Just like humans, pets should get adequate nutrition from the most reputable pet food brands. This way, our gleeful furry companions will be even healthier. A plethora of pet food brands exist with vast assortment of flavors, treats and recipes. Hence, choosing a suitable brand can be daunting. The important question is, “what should I look out for in pet food brands and how will I know the right one”? During the course of this article we will answer all your possible questions and about what pet food brand is best for your pet and what to look out for when purchasing a pet food brand. We will explore the strengths and weaknesses of these brands. Close attention will be paid to nutritional value, brand reputation, pricing, ingredients and more. 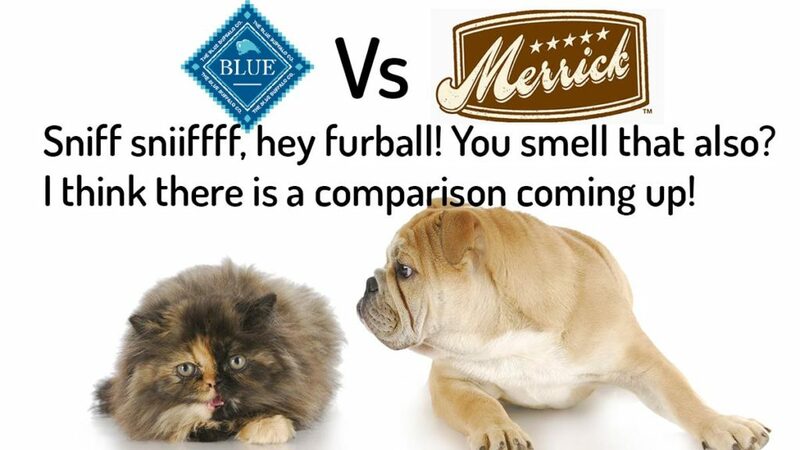 After you are done with this awesome comparison, check out Merrick and Blue Buffalo here to see the different flavors and pricing. Merrick takes the lead in this category while Blue Buffalo follows closely behind. It trumps Blue Buffalo with a whopping 8.67 percent difference for the dry pet food category. Merrick food product also has more protein for the wet food category, although with 3.24 percentage which is clearly a lower range. Blue Buffalo food products are more affordable than Merrick’s, especially in the dry food category while Merrick still provides cost effective flavors. Of the two brands, Blue Buffalo has most recipes. It has 85 recipes for dry dog food and 101 recipes for wet dog food. For dog treats, it has a total of 51 treats. Cat food comes in 40 recipes for dry food and 47 recipes for wet food. Cat treats have a total of 15 types. whereas Merrick has 37 dry dog food recipes and 65 wet dog recipes. For dog treats, they score a total of 38 treats. For cat recipes, Merrick has 13 recipes for dry food and 51 recipes for wet foods and 2 cat treats. Blue Buffalo has the highest number of recalls. It has been recalled 9 times while Merrick has a lower number of recalls with only 6 recalls in their brand history. As shown on the table, Merrick has 6 different product variations both for cats and dog. It records a total of 206 food products for cats and dogs. Similarly, Blue Buffalo has 6 product types for cats and dogs. The total food aggregate within their product range is 339. While both brands have a very large pool of products, formulas, recipes and treats you can choose from, Blue Buffalo undoubtedly offers more variety. One of the core functions of feeding is that it nourishes and provides the necessary nutrients needed for bodily function. In appraising food brands, nutritional benefit is a critical factor. Pets are particularly fragile and sensitive, so you must understand the nutrients needed by your pets and the ones that may have adverse effects on them when taken excessively. Rates of metabolism, peculiarities based on species, allergies and other factors necessitate the need for caution. Generally, pets essentially need protein because their body synthesizes below the necessary requirement. Apart from protein, fat and fiber is very essential to their safety. The table below compares the nutritional components of Merrick and Blue Buffalo. As you would have observed on the table, the three major nutrients used to measure the nutritional value of food products include fat, fiber and protein. This is clearly due to the fact that these are the most important components of a balanced diet. In addition to this, AAFCO clearly spells out the importance of these nutrients by making them yardsticks for nutritional quality control process. You might wonder, “Why are these so important?” Let’s explore the reasons. Pets need protein for optimal bodily function and a stronger immune system. Dogs and cats can neither survive without the amino acids supplied by protein nor synthesize enough amino acids naturally. The required amount of protein can only be met through consumption. This explains why a food product without sufficient protein might be hazardous to their health. Protein supplies energy, fixes worn out tissues, build up muscles, hair, skin, ligaments among others. If not for anything else, our furry friends need healthy hair, and protein helps with that. Deficiency in some amino acids can lead to loss of sight and heart failure in cats. Dogs are energetic and active; hence, lack of protein can hamper healthy living. Most times, we approximate fat to obesity; this is not the case for pet food. Fat is indispensable for a balanced canine and feline diet. It is a powerhouse of energy, cognition and fat soluble vitamins. No one likes regular trips to the vet over health impediments of pets. Fat is great for reproductive health, strong blood pressure and power building. Fat helps induce appetite by making food texture more attractive. When checking food labels, be mindful of fat content because some contain more fat than is required because it makes food tastier. The dietary standard for fat content in pet food fundamentally depends on their age. Consuming below or exceedingly above these recommendations may not be a healthy option for your pets. Fat can pose to be a danger when it is over consumed. Excess fat in the body can cause diseases like pancreatitis which can lead to loss of life. See table below for AAFCO recommendations. Fiber is another essential nutrient in pet food. No need to be worried when you hear that it is indigestible because that is hardly the case in this context. Fiber is great for keeping the gut intact and healthy. It aids digestion by helping to churn ingested food so that the body can absorb all nutrients. Overweight pets are encouraged to eat foods with high fiber. However, you should note that when fiber is in their body system in improper proportions, it can lead to constipation. It is no news that water is great for the body, this applies to all bodies, both human and pets alike. It is ironical that this very essential nutrient receives the least attention. Hydration preserves pets’ body and keeps the doctors away from them. Here are some fun facts about water: The body component of the adult dog is 70 percent water. Their cells, blood and tissues mainly contain water! Water regulates body temperature. Without enough water, your pet can die. Water improves digestion, protects against urinary tract disease and blood circulation problems. Nutrients move within the body, and are absorbed, with the help of water. Lack of water may lead to organ failure so keep water in clean bowls where they can easily drink. Pricing is a major role player in choosing your preferred brand food. There are so many brands to choose from but their prices vary. The way to get the best bargain is to compare prices of leading brands in a bid to decide the premium brand that sells at a reasonable cost. While you do not want to sacrifice quality or product safety, you also want to choose a product that is within your budget range. The table below contains information on the price of Merrick and Blue Buffalo food product. As demonstrated above, the costlier of the brands under review appears to be Merrick but there are several other factors that determines how much you save and which brand costs you less. Your shopping habit and your pet food preference (wet or dry) are predominant factors. Apart from these, the most important mode of measurement is cost per kcal. So, it is advisable not to conclude based on face value. What is life without variety? One of the greatest merits of the Merrick and Blue Buffalo brand is their numerous food flavors. Both brands have rich assortments of food products and this gives pet owners the liberty to choose. How do they arrive at different flavours? The major ingredients that constitute these food products give them different flavours. While Merrick uses locally-sourced ingredients Blue Buffalo also selectively sticks to natural ingredients. Both brands do not use artificial flavors or fillers, this makes their food products very delightful to the taste bud. This brand has loads of richly made pet food with unique flavors. Some include: Beef, lamb, salmon, sweet potatoes, chicken, chunky lamb in gravy, grain-free packs, green peas, rabbit, game, buffalo, venison, garlic, caramel color, canola oil, pea protein, powdered cellulose, meaty femur bone among others. They have an interesting range of gourmet flavours like Brauts-N-Tots, Cowboy Cookout, and Grammy’s Pot Pie. All their products are combined in different ways to create unique recipes with distinct flavors. This brand is also famous for owning several flavors. The wilderness range is arguably the best and most popular product range. Other major ingredients include: Chicken, red meat, duck brown rice, lamb, salmon, potatoes, turkey, fish, gravy, caramel, pea protein concentrate, tomato pomace, dried tomato pomace and much more. These ingredients listed above are whipped together to create various flavors, recipes and treats. With this variety, there is always something for pets regardless of their preferences or allergic triggers. Check out the current Merrick and Blue Buffalo recipes here. As you would imagine, this brand was created by a pet lover, Garth Merrick. He created the award-winning brand about 30 years ago in the Merrick’s family kitchen in, Hereford, Texas. The brand started with dog treats called “Flossies”. Flossies helped improve dogs’ oral cavity and breath. Merrick recorded a huge success and started creating all-natural, delicious, balanced canine and feline food. By 2003, they had expanded operations and created hundreds of recipes and flavours. The following year, the brand launched their grain-free food range to cater for dogs and cats with special dietary needs. The “Real Food Revolution” of 2012 heralded their campaign for 100% natural pet food. Merrick made a “five star promise” to their customers. They relied on local farmers for ingredients, used real, whole-foods with no artificial flavors, manufactured meals in FDA approved human kitchens, served products generously with meats and complex carbohydrates and assured dogs of balanced diet. There is also guaranteed cash back if any product fails to deliver on these promises. Blue Buffalo manufactures and dispenses dog and cat food in different forms. It was launched in 2012 as subsidiary of Blue Pet products, and it started its operations in Wilton, Connecticut and expanded to places like Indiana, Missouri, Richmond and Joplin. The inspiration for this product line came from the death of Blue, a family dog. After this unfortunate incident, Bill Bishop and his sons created a pet food brand that is made from natural and healthy ingredients. Their mantra remains “love them like family, feed them like family”. This brand is mostly popular for its wide variety of recipes flavors and treats. Blue Buffalo is a premium brand that does not compromise quality and safety in food production. They maintain a reputable stance till date. Blue Buffalo has lots of recall in their production history. This brand has been recalled nine times. This was clearly a tough one because both brands are excellent and reputable. You will observe that both brands have close features. These brands are health-centric as they use quality and natural ingredients. Both brands also have lots of treats, recipes and flavors to choose from. We have to declare Merrick the winner because they have operated longer than Buffalo and they have less history of recalls.